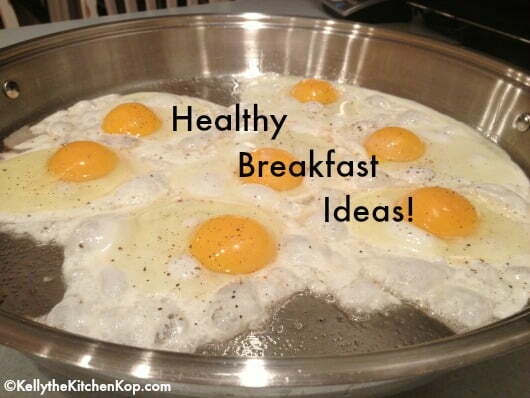 More healthy breakfast ideas are at this link! Do you struggle with finding enough healthy breakfast ideas like I do? Do you wonder if there is such a thing as healthy breakfast cereals? I hope the following list will help, but be sure to check back in the comments below, I'm hoping many of you will share your best healthy breakfast ideas, too! Since writing Monday's post about breakfast cereals (and another one “What's wrong with breakfast cereals?”), I'm re-thinking whether we should go back to not buying any boxed cereals again. With boxed cereals, we're spending a lot more money for very little nutrition, it doesn't make sense. If it weren't for my complaining teenager, it wouldn't be such a big deal. The others just happily eat whatever I put in front of them, my husband included – he'll eat whatever we have here, and thankfully is completely on board with our goal of eating healthier. But our oldest is not as easy to please (not unusual for a teen, I know) and loves a bowl of cereal now and then. More and more, I'm going to focus on the healthier options below…as a matter of fact, I've got some oatmeal soaking right now for breakfast in the morning! (See the post at the oatmeal link below if you don't know what I mean by “soaking” – and don't worry, not long ago, I didn't have a clue either.) ***Update: click here for a sprouted breakfast cereal. One more, do you wonder, Is there such a thing as a healthy breakfast juice? Note: Some of these are really carb-heavy, so if you're watching your carbs, beware. Choose eggs, veggies, and pastured breakfast meats from healthy farms instead! See my entire list of Breakfast Pancake Recipes (or waffle recipes) and the different options here, including gluten-free options. Some you start the night before for extra nutrition, but others are healthy last-minute versions! Be sure and serve with plenty of pastured butter and real maple syrup. 🙂 Also, don't forget to freeze any extras to pop into the toaster on busy mornings for a quick breakfast. You could serve with fresh fruit and/or some farm-fresh sausage or bacon — find healthy pastured meats online here that have no MSG or nasty preservatives. Here's a healthy breakfast oatmeal — it's aSUPERFOOD version and so tasty! You can make extra of this, too, and warm it up the next day for another fast breakfast. Here's a simple make-ahead oatmeal recipe that everyone loves: Sue's baked soaked oatmeal recipe. Healthy Egg Recipes – we eat a lot of eggs with cheese or egg sandwiches. 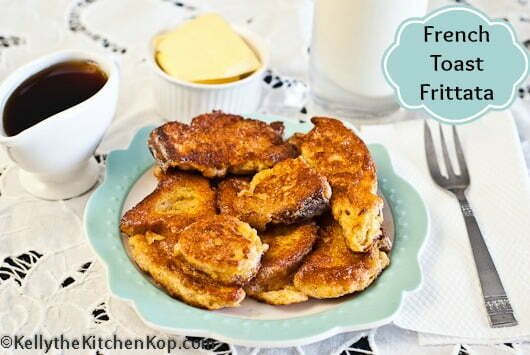 We all love “French Toast Frittata“, it's fast and sooooo easy! Smoothies – I freeze any extra in popsicle makers for a treat later. These are a great way to get more coconut into your diet, too. Good ole' toast is best with whole grain fermented or sourdough breads (here's info on my homemade bread) with things on top like organic nut butter, plenty of butter, organic or homemade jams with less sugar, raw local honey, etc. Whole milk yogurt – even better: homemade raw milk yogurt. Remember, it's not easy to find something other than low-fat yogurt, but whole milk products are much healthier! 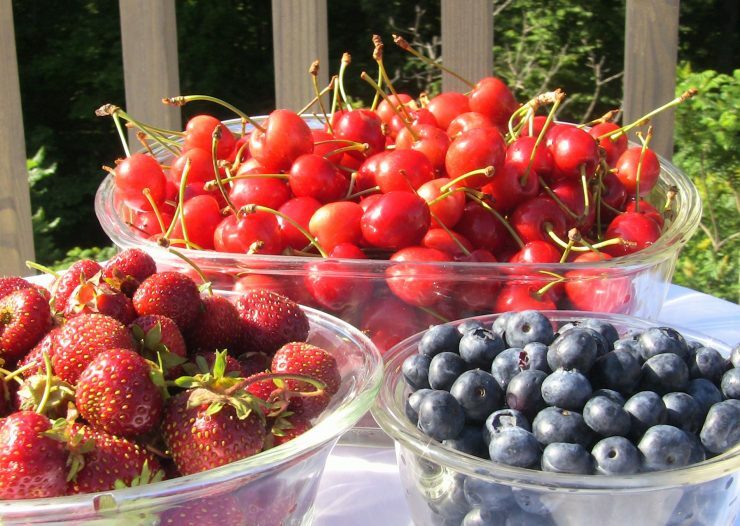 Fresh fruit – preferably local and organic. Certain breakfast cereals as a “compromise” food – read this post on breakfast cereals for more information. Also, check out the recipe for Graham Cakes in the comments at that post, too. Click here for a sprouted breakfast cereal! Sometimes if we're on the go or if the kids aren't in the mood to sit down long enough to eat breakfast, they'll just have some cheese and/or dried fruit, like organic raisins or cranberries. OK, I know I said 10, but here's one more that I added later: Gail's Healthy & Easy Breakfast Burritos. And another one: Judy's breakfast casserole. Don't forget about breakfast meats, like bacon or sausage, from a local farm who raise their animals well, or from another source for healthy meat. Try this quick Real Food Protein Drink that isn't made from an unnatural soybean protein powder but instead it's made with traditional, superfoods! What a great idea for make-ahead sausage, egg & cheese biscuits from Megan in the comments at another post: I know it can be hard having breakfast on the table every morning before the hubby leaves. This is what works perfectly at our house. I make up a batch (12-14 at a time) of soaked, whole wheat biscuits. I then cook a lb of sausage (shaped into patties) from a local farm and a dozen or so free range fried eggs. I then assemble them and freeze (I was really unsure of how the fried eggs would taste after being frozen, but it works just fine). Every night before we go to bed we take one out of the freezer and put it in the fridge to thaw. In the morning he just pops it in the toaster oven with a small slice of cheese and he has a very filling, homemade breakfast ready to go every morning even if I’m not up yet. This has made such a difference for me knowing that I don’t have to get up even earlier than him every morning ( I have a toddler and another one on the way). I know, I know, it would be even better if breakfast every morning involved fruits and veggies; but we’re getting there, one step at a time. 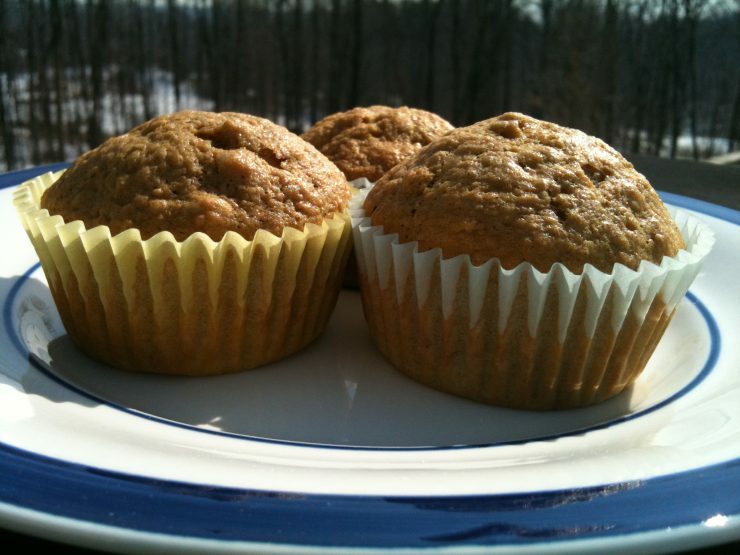 See #5 at this how to make foods ahead post for fast fresh-baked muffins in the morning. I'll add this one from the comments (forgot to include it with the original post): homemade ice cream for breakfast! Obviously the kids love it, and the ingredients are so good for them – with less sugar than they’d have on a pancake! I am the omelet QUEEN! Quick Quiche Cups – these can be made ahead! These ideas aren't just for breakfast. We'll often have blueberry pancakes or egg sandwiches when we need a quick dinner…or for those times I forget to make anything until it's 5:00 and Kent is on his way home! WHAT HEALTHY BREAKFAST IDEAS DO YOU HAVE TO SHARE? Remember you can find more healthy breakfast ideas (with nicer pictures!) at this link! I used to eat cereal every morning – sometimes mixing two or three together, but since changing to a more ‘real’ food I find I don’t even give them a second glance at the supermarket now. I usually will eat eggs, fruit or pancakes and am loving it. So did I Mary!!! It’s sad to think of now (& all the boxes of junk I fed my kids! ), but at least we know better now. In your Real Food Protein Drink, why use only yolk and not the whole egg? In my raw milk kefir smoothie I make most mornings for breakfast I use a whole egg – should I not be doing that? Check out this post for why it’s best to only use the raw yolk: https://tinyurl.com/kuts5fb. Be sure to read the link I added as an update at the bottom for more good info. p.s. Today would’ve been Mom’s 80th birthday and we’re going to the Mass for her later that you set up, thank you again for doing that. I eat eggs for breakfast and lunch almost every day. I started in December. I put syrup on them, too. It tastes really good. Since this post has been revisited, I think it should be scrapped, based largely on recent massive scientific evidence for the intestinal damage caused by grains, especially to the intestinal tight junctions. Here are a couple of posts on salt that you may want to read. Salt is something our body needs. i Have this really good idea. ok so all you do is get a waffle and ofcourse efrost it or put it in the toaster thenget strawberries and blueberries and Slice the strawberries. then place them over the waffle and place some blueberries over the waffle. last get syrup and drizzle it over the waffle. There you have a healthy breakfast to eat and it taste’s good. I had soup! Homemade vegetable soup with grass-fed beef bone broth. I struggled trying to eat healthy breakfast food only because I was programmed to believe it had to be cereal, eggs, pancakes… I still eat eggs a lot, but I’m really enjoying my soups lately. I have also enjoyed eating scrambled eggs wrapped in seaweed (vs. a tortilla or on bread). Interesting! Ok…made these this morning. Had a couple issues but overall they were good…very filling! As you know, coconut oil is a solid at 70 degrees +, so when you add the melted coconut oil to the mixture, it turns back to a solid. So i had to heat the whole mixture on the stove just prior to adding it to the waffle iron. We used applesauce and honey for flavoring and to beef up the consistency. The kids ate theirs with organic maple syrup. I ate one waffle with almond butter on top. It made four waffles, not eight as the recipe suggests. We will make these again! Happy Baking! I had a glass of green super drink stuff ( lots of super foods), seed cracker with chicken liver pate, and Dandy blend with raw cream. weird but good. Megan Sheldon Copeland – what did you think? 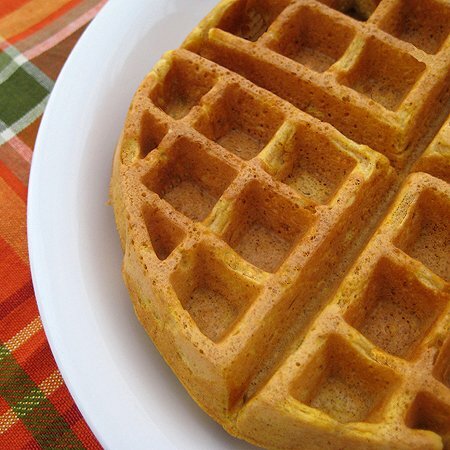 https://www.healthhomehappy.com/2010/12/coconut-flour-waffles-grain-and-gluten-free.html this is what we tried today. I’m on day 8 of my 10 day juice fast. I usually make a green juice but thought I’d change it up with a cranberry carrot apple orange. My “breakfast of champions” always revolves around a couple eggs (pastured) fried in butter (or bacon fat) and served with homemade sauerkraut or kimchi. Along with that, I might have a banana, baked oatmeal, GAPS legal or gluten free baked goodie of some sort (muffin, quick bread, etc…), or bacon. Breakfast at my house is a hard one. We don’t do cereals, most grains or dairy, eggs, soy, or pork. So, our breakfast is meat and veggies. We have chicken, turkey, and beef burgers seasoned in various ways with a huge variety of veggies, cooked and raw. We do occassionally have turkey or beef bacon, but the preservatives (or something) end up causing various digestive issues, so they are limited. I make my own turkey breakfast sausages. Because we can’t have dairy, we use Earth Balance Soy free spread. We can’t even use Ghee. When and if we have any grains, my kids cheer. But, they have noticed a lack of concentration and a reduction in their stamina with sports on days we eat grain, So, even that is limited to a non-school and non-sports day. We love plain ole hamburgers for breakfast, chicken burgers seasoned with garlic and sea salt or homemade taco seasoning, homemade turkey sausage, turkey burgers seasoned with garlic and sea salt, chopped ground beef with peppers and onions, sometimes tuna and sometimes bison. I hope this helps others who are on this road to healthy families! Two eggs fried in ghee with pepperjack cheese on Rudi’s bread with skim of org mayo… 1/2 a pork steak. Org decaf with Stevia and raw milk. Hi Kelly. This is a little off-topic but I found this post from your newsletter. 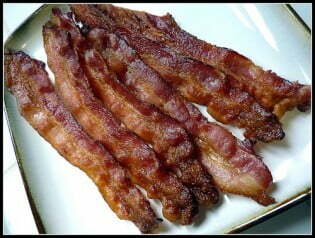 Anyway, I really enjoy bacon or sausage every once in awhile for breakfast. I have yet to find pastured pork. Does that exist? I have found a local supplier of hormone and antibiotic free pork. Is that just a “gimmick” or are most pigs fed hormones and antibiotics? I plan to check it out later this week to make sure there isn’t MSG or nitrites either. Thanks! The key is to know your farmer. My farmer has his pigs out on pasture, foraging around eating stuff they’re supposed to, not leftover baked goods or other junk that he got cheap from a local grocery store. Just ask lots of questions (try asking your local WAPF chapter leaders if you need to know where to go) and make sure you feel comfortable with how the animals are raised. Great question! Check out my healthy breakfast ideas! YYYUUUMMM!!!! soaked oatmeal smoothies with raw egg yolks, homemade raw milk kefir and/or yogurt, fruit. We soak and bake oatmeal, using a little maple syrup to taste, and perhaps adding dates, raisins, cranberries and soaked almonds or pecans and season w/cinnamon, nutmeg…you get the idea. It’s really flexible according to individual tastes. I spread it out thinly on a large cookie sheet and bake at around 250-300 degrees. As it dries, it can be broken apart. When there’s no moisture left, remove from oven, cool completely, store in mason jar. If it’s a little too crunchy for your taste, just let it soak up the milk a bit before eating. We like to use it as a garnish to home-made yogurt, too. AND, if you don’t want it sweetened, omit that and sweeten to taste when eaten. Oops! Another good addition to it is unsweetened coconut! Susan’s walnut-apple-raisin mix sounds delicious — and nutritious. I often eat a jigh-fiber “salad” of walnuts, pecans, celery, and red bell peppers. Thanks SO MUCH for linking back to this – I really need to clean up our breakfast eating. My 3 year struggle with insomnia means that mornings aren’t my best time, so I rely on too much quick junk. I linked to this in my weekly roundup, and also why we shouldn’t eat breakfast cereal, the baked soaked oatmeal, homemade breakfast cereal, and it reminded me to dig out Sarah’s Musings (now heartland Renaissance)’s grain free granola. Can you give me an off-the-top-of your head suggestion? I bought a dehydrator for my birthday/mother’s day gift. It is similar to an Excalibur (though Cabela’s brand) except it only came with one tray liner, and it’s more to catch drips than to do things like make fruit leather or dehydrate oatmeal. Any thoughts? Or suggestions on where to poke around? Thanks! Did you mean you wanted a suggestion for a bigger dehydrator? Someday I’m getting the big Excaliber for sure! 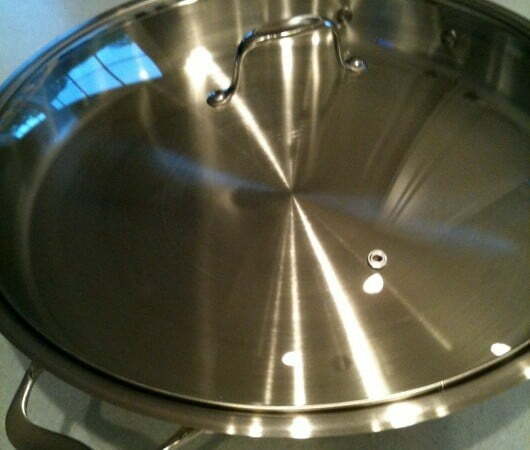 You can find it on my resources page – just scan through the companies there to find where they have them: https://kellythekitchenkop.com/Bosch” target=”_blank. (And thanks for supporting my sponsors!) For now I just put my oven on the lowest setting and do it that way. Karen, husbands who love to cook are GREAT aren’t they?! And I’m with you, I loooooove my bacon – it’s the perfect crisp with my morning eggs so I don’t even miss the toast! You know, Kelly, if you’d come over, and fix it, I MIGHT eat crispy pecans w/ pamesan cheese….and fruit. hahaha…It just sounds like “oysters” sounded to you. 🙂 I love ALL those ingredients tho. I do however, “cook” my breakfast and lunch…he fixes dinner. And I was getting bored…Whenever I get bored I get MORE NT!! LIke I fix bacon…after recovering from [still am] low fat dogma, I can’t tell you how happy lovely bacon makes me chuckle. Who could have guessed? And, I just started buying ghee from a woman in my NT monthly potluck group. Now that is something else. I had no idea it was so tasty. I had it in India years ago: I like this ghee better…if memory serves me right. I just put it on my veggies after cooking them briefly. Heavenly. Thank you for writing about what to eat for breakfast. I love waking up hungry and rummaging around for what I want to try next. Love you guys mucho!!! YOU ROCK!! Susan, love your breakfast idea. I do something similar for a tasty snack now and then: apples or other fruit, crispy pecans, parmesan cheese. I loooove this. Another note for Rachel-I can my applesauce with no sugar. I use a very naturally sweet variety (Golden Delicious). Quarter them and cook them in the oven in a large covered roasting pan and water to cover the bottom. Keep the oven low, 200 degrees or so, and check on them in an hour or two or three. Then I scoop them out and put them through my Victorio Strainer. Bring the sauce to a boil and can. Sooo, if I can do it without sugar, I am pretty sure you could do it using stevia. I am pretty sure the sugar is only for flavoring cause I know diabetics can can without sugar. Maybe you can check on canning for diabetics to be certain. For Rachel-I have used stevia while canning grape juice. My oldest daughter doesn’t like the stevia aftertaste but it tastes fine to me. For jam making I use the “no sugar” box pectin and then I add an optional one cup of sugar. It is still sweet but you can taste more fruit flavor than when you add the typical three cups of sugar to a regular box of pectin. And here is my healthy breakfast idea contribution: Core and cube one large apple (or equivalent), add a handful of raisins, chop a handful of walnuts (or other nut) and add, drizzle with raw honey. Mix. Eat. A sprinkle of cinnamon could be a variation. I use the “no sugar” freezer jam and jelly pectin too. But I follow the direction for using Splenda and fruit juice. Instead of using Splenda, I just sub organic cane juice crystals. And then frozen fruit juice concentrate. Now this is not really “low sugar” as fruit/juice has a TON of sugar, but it is more of a ‘natural’ sugar I think. . . .so I don’t mind a spoon of it or two in the mornings. Then I freeze the jam in the freezer. It tastes really good and comes out to about 1/2 cup of organic sugar for each batch of 5 pints. I wish I knew how much you could cut sugar when canning, but I haven’t canned things yet…soon I hope. p.s. For applesauce I use maple syrup, it’s sooooo good. We like to have farm fresh eggs and homemade whole wheat toast for breakfast. I make my own jam/ preserves but my recipes use a ton of sugar! (So do many of our canned fruits. To what extent can i cut the sugar out (my husbands family likes things really sweet) and what would make a good substitute? Would Stevia work for sweetening those. Would it mix into applesauce evenly? I think our canned fruit uses sugar as a preservative too and I don;t want to compromise the preserving power. Another great way to make jam is to dehydate organic berries when they are in season and CHEAP! You can then freeze them and when you want some jam, soak the dried berries in some water overnight and blend the next day when they are soft. Incredibly delicious! Wow, Megan, good for you – you’re doing the very difficult thing for the good of your family. Be sure to get on some Yahoo groups for some good support to help you through. Those Moms have been there and can give you lots of advice. I’ll say a prayer for you that it goes more smoothly than you could ever imagine! I was excited to see this post and all the other great info you have on here. We are preparing to begin a gluten-free, casein-free diet for our family. We have two boys with asthma, eczema and allergies and we are excited to see how this diet will help improve everyone’s health. I think breakfast will be the hardest change for my boys as we eat too much cereal right now. Thanks for all the great info! Sorry to be commenting again but I need to correct all of the nasty spelling errors in my previous comment. If I’m really in the mood for cereal, I make my own with oats and nuts and maple syrup. I mix the oats and nuts with just enough cereal to make it sort of stick to gether and toast it in my toaster ove until its a nice color. THen pour milk over it and it really hits the “i want cereal” spot! My parents had us pay for our own junk cereals if we wanted them…Mom would buy unsweetened cereal for the family, but rarely junky stuff. Why worry about a roller? Steel cut oats are really yummy, anyway. If you do really want one, https://www.lehmans.com is the place to check. Hmmm, I’d never thought of that, but it’s a good idea! My mom taught me that the a.m. is sometimes the best meal to get veggies into a hungry tummy….so soup is usually welcome by the kids. “magic broth” and “oatmeal soup” are some favorites..to the magic broth [just your basic NT broth] add some alphabets…somehow this clinched it for our now 5yo…and reheating oatmeal in broth for the oatmeal soup with some creme fraiche added to both seals the deal. Kelly–your recommendations on a grain roller for the oatmeal? I understand that even organic oatmeal that you get at WF can be nutritionally dimished at best and rancid at worst. Any insights into a costeffective way around this…grain rollers and grain grinders are so expensive! Great recipes! Thank you so much for participating. I usually have cereal around for those “in case of emergency” days, but I am rethinking that too. My kids are always starving by 10 am when they eat cereal for breakfast. In the breakfast cereals link in #9 above. Where is the recipe for Graham cakes? First, I LOVE your name! That’s awesome that your one son is all organized the night before and makes his own smoothies! For a healthier protein than the powdered kind, we drop in 1 or 2 egg yolks. Be careful not to try this with grocery store eggs, though – only use eggs from a good farm with pasture-fed chickens that aren’t fed any junk. You can’t even taste them, but I love knowing how much extra nutrition we’re getting! Yes, cereal is evil. We have boxes and boxes of it. My middle son sets out all the makings for the smoothie the night before, blender, banana,protein powder etc. He has it down to a science and I’m grateful. Now to get the other two boys off cereal and on the smoothie train! It’s easy to slip into that habit, for sure. So what I’ve been doing lately is only getting the Kashi cereals now and then when I see them on sale. When I bring them home the kids cheer – if only they’d do that over oatmeal! I don’t but these anymore or any cereals, there are many more nutrient-dense options out there! Your pumpkin pie for breakfast story reminded me of something else I’ll give the kids now and then: homemade ice cream! The ingredients are so good for them, with less sugar than they’d have on a pancake! I’m normally really good about reading labels. I can’t believe I let Bisquick get by me. That stuff is scary, I’m glad you said something! I found a couple of recipes for bisquick substitutes on cooks.com and recipezaar. My sons love, love, love breakfast burritos. Eggs, bacon, potatoes, salsa, cheese, beans, whatever I’ve got on hand usually does the trick. Their other favorite is: pumpkin pie w/loads of whipped cream. Nothing like a large helping of beta carotene for breakfast! Thanks for the great ideas! One question though: does anyone have a homemade bisquick-type recipe for a healthier baking mix? I know I’ve seen one somewhere, but can’t remember where. Kelly, I use Pamela’s Baking And Pancake Mix (gluten free) which I love. I love the idea of having older kids pay for their own treats. Growing up we got one box of sweetened cereal on Christmas morning and it was such a treat. Here are a few more ideas for you: muffins are quick and easy and can be a good, healthy choice. Breakfast burritos can be made in bulk ahead of time and frozen and reheated. Be sure to check the ingredients on your tortillas though. I’ve also got a recipe we love that mixes cheese, milk, crumbled breakfast sausage and Bisquick, to make a sort of biscuit that reheats great and is so tasty and filling. Oh – we like cinnamon toast for a treat and quick breakfast too. I don’t ferment my grains, but I do have a mill, and don’t use any white flour in my breads….. that’s “my” compromise. None of us have grain allergies, and we consume all our bakery items in the form of my homeade, freshly milled baked goods….. works for us. I will use sucanat, or a little bit of cane juice crystals on the cinna toast. It’s a treat.